Makita made some major changes from the XBU series original blower. The newest 18V X2 LXT Brushless Blower brings down the speed and trades it for much more air volume in a completely new design. Makita is staking its claim to pull away from the crowded field of lithium-ion blowers with its latest offering. 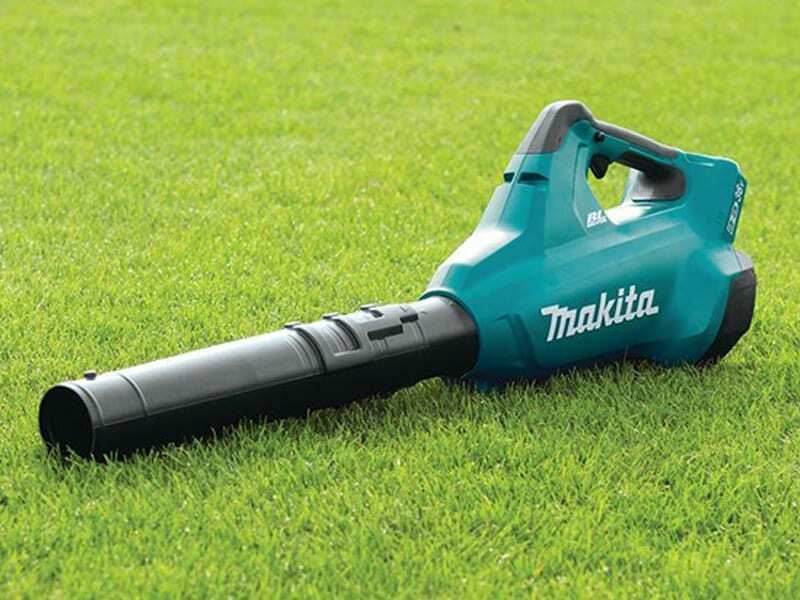 Unlike many battery powered brands out there, Makita has a line of gas powered outdoor power equipment, including 4-stroke tools, to help draw their development. The Makita 18V X2 LXT Brushless Blower is now in its second generation as model XBU02Z with a few changes over the 01Z model and we expect to see continuing improvement. The most obvious change is at the nozzle tip. Makita has moved away from the reduced size, flat tip that increases air speed and changed to a wider nozzle that promotes air volume. The debate between air speed and volume is as old as Coke versus Pepsi. Okay, maybe it’s not that old, but it’s been around pretty much since the first blowers were developed. The bottom line is that both are important, but the balance in design seems to be somewhere between a wide and narrow circular nozzle, leaving the flat tip as an afterthought for jobs on hard surfaces only. That said, Makita’s first generation XBU blower pushed 155 CFM of air at a nozzle speed of 208 MPH. The new Makita 18V X2 LXT Brushless Blower shifts to 473 CFM at 120 MPH. Speed of the impeller has jumped from 17,000 RPM to 21,500, though that could have to do with a design change and not simply a power increase. The increased speed comes with a higher noise level, going from 86 dB(A) to 96 dB(A). Makita also went to an inline fan design that should prove to be more efficient. The last bit of comparison shows a weight increase and a move from 2 speeds to 6. I first questioned the point of making a 36V system that runs on two 18V batteries. It forces me to buy two batteries instead of one. As I looked around the shop though, I realized I don’t have much need for 36V tools. Other than my LXT 18V X2 Circular Saw, this is the only other one I have. Makita is connecting these two batteries in a series to double the voltage, but I don’t have to buy into another battery platform to take advantage of it. That’s a win in my book. We looked at a lot of the features already, but there are a few more things worth mentioning. The nozzle telescopes to three different positions with a twist and lock design. I’m a tall guy and so is my son, so we leave it in the longest position. There are two charge indicators under the handle. It takes both batteries to run the blower, so it will shut off early if one battery is less charged than the other. Balance and grip are both excellent with the batteries installed. It’s easily held and used with one hand. Net Weight (with battery): 9.9 lbs. If you’ve been keeping up with us, we’ve had a plethora of blowers come through – from 18V all the way to 80V. For the most part, I’ve been using my Greenworks 40V Blower to keep the shop and porches cleaned up. It’s a couple of years old now, but has done fine for what it’s been tasked to do. Flipping the Makita 18V X2 LXT Brushless Blower to high, the power feels crazy-good comparatively! It’s easy to extend the run time with a pair of 5.0 amp hour batteries by cleaning up the shop on a lower settings. In fact, I need to dial it down. Dirt, leaves, and sawdust hit the opposing wall and get blown up it from quite a distance when there’s no place to exit. We mainly have oak trees on my 5-acre lot. With most of the blowers I’ve tried, there’s not much that can be done about moving the winter droppings around. However, I was pleased to find that I was able to easily move those leaves around more efficiently than before. It’s still not enough to effectively move every single leaf from the grass surface, but I can get the majority of them into a pile for cleanup. Makita balanced air speed and volume well with this model to create a blower that can really move some material. The blower’s ergonomics are outstanding. Everyone is still going to want to know how it does compared to a gas blower though. We’re still not there on the commercial end, but the Makita 18V X2 LXT Brushless Blower can easily handle most of the tasks you’ll find at home and on the jobsite. Where there’s still room for improvement is in the ability to dig both broad and narrow leaves out of the grass for cleanup. The blower will set you back $259 – that’s on par with models from Stihl and Husqvarna. If you’re already on Makita’s 18V LXT battery platform, you’re not having to buy into a new system and you’ll end up with a blower that you can use at home and on the jobsite. Can I use two 4Ah batteries or do I have to use 5Ah?